Just in time for Fall and leaf cleanup, this Black & Decker LH5000 12 Amp Variable Speed Electric Leaf Hog Blower / Vacuum With Zipper-Less Leaf Bag makes a great gift idea for the guy who has this seasonal project on his to do list each year. 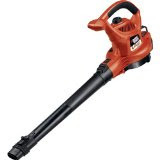 Also great all year round, it's easier for him to keep the yard neat and tidy with this ultra-powerful electric three-in-one blower, vacuum, and mulcher from Black & Decker. - Includes a tube with LeafBlaster nozzle, vacuum attachment with tube, zipper-less leaf bag, adjustable shoulder strap, and air concentrator.